William Quincy Belle: Rob Ford or the public: Now who's dumber? This past week has seen the most unusual of events of the city's political scene. A marathon session of Toronto's city council's executive committee of over 21 hours saw over 300 people representing union members, arts groups, social agencies and others present their opinions about what to cut and what not to cut in Toronto's budget. There is an estimated $774 million funding gap in next year's budget and the mayor is going to have to cut something to save some money. The question is cut what? As part of the mayor's pledge to find the "gravy" at city hall, Ford's administration commissioned KPMG to do a study of 155 of the city's "core services". The 400 page report lists $700 million worth of cost cutting options including the closure of libraries, the elimination of subsidized daycare spots, stopping water fluoridation, closing the affordable housing office, the sale of the Toronto Zoo, scaling back snow clearing, closing city-owned theatres, cutting back on night buses and crossing guards. The Globe and Mail reported that throughout the night, presenters chose different methods to get their point across. One sang a song, another read a poem, one wrote a short story, a young man performed a puppet show and a retired teacher delivered a satirical essay. Most simply berated the committee. But the message was the same: don’t cut anything. Every politician gets voted into office by a group of people who have hoisted him onto their shoulders as their saviour. Inevitably, the lustre of future success wears off as reality sinks in with oh such a harsh tinge. As the groundswell grew last year for Rob Ford's buzz phrase "Stop the gravy train!" the popular sentiment turned to shaking up city hall as my gawd, those fat cats down there are stealing us blind. However throughout the campaign as Ford repeated ad infinitum (or was it ad nauseum?) how he was going to find $2 billion in savings without cutting any services, I kept scratching my head over and over again in perplexed reservation because something in all this political rhetoric didn't quite add up to a mathematically sound financial strategy for running the city of Toronto. On Sunday, October 18, the Toronto Star in an editorial announced its support for George Smitherman. The newspaper said that "only one candidate has the proven political skill, government experience, commitment to change, negotiating ability, compassion, drive, determination and charisma that — taken together — would amount to an effective mayor. George Smitherman is that candidate." The Star went on to recognize a host of chronic problems which plague the city of Toronto such as "budget shortfalls, crumbling infrastructure, gridlocked roads, under-built transit, a shortage of affordable housing, and disadvantaged neighbourhoods that foster crime and poverty." It added that while Rob Ford has tapped into the popular sentiment of "It's time to stop the gravy train", Ford has failed to present a concrete vision of how to deal with the issues while Smitherman has not just the experience, but the fresh perspective necessary for the position of mayor. The mayor has proved himself entirely unreliable. He has failed to produce evidence of the fat at city hall. He brings in consultants who tell citizens the very services they treasure — libraries, police, firefighters, recycling, day care, TTC, snow removal, public gardens, museums, arts and culture — are where the “savings” must be found. James goes on to explain that Rob Ford promised to find $2 billion in the city's budget without the average citizen noticing and do it without cutting services. This has turned out to be an empty promise. It seems there is no "gravy" and there never was the "gravy" that Ford was leading everyone to believe. On top of it, he went ahead and made some political brownie points by killing the vehicle registration tax which brought in $60 million and the land transfer tax which had $250 million in annual revenues. Now that we have all arrived at crunch time, the only way of balancing next year's budget is to cut something that people actually want. Royson James sums up with: In short, Mayor Rob Ford’s credibility is shot, shredded, blown to bits — victim of his excessive rhetoric and unsubstantiated claims. Rob Ford was voted in not quite with a landslide but enough that one would think the Toronto citizens wanted a change. Did they get one? Politics is a game of buzz words, feel good phrases and smiling warmly while shaking your hand. Unfortunately, at some point that politician has to do something. Running a city, heck running a country (don't get me started on Harper!) is not easy. Anybody who runs for office has got to have a great deal of arrogance as I imagine they haven't got the foggiest idea of what they're getting themselves into. Rob Ford convinced the voters he was going to make a difference. Rob Ford convinced us that he knew exactly what he was doing. Okay, so where's the beef? Mr. Ford had not yet sat in the driver's seat when he was campaigning. Mr. Ford had not yet looked at the books when he made promises he now can't keep. Mr. Ford claimed he could run the city of Toronto when he had never a city before in his life. Was that dumb? But the public voted for him. Now just who's dumber? 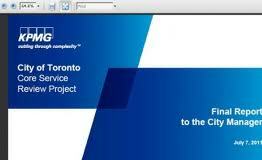 The conclusions drawn by the consultants hired by Rob Ford are the same as the talking points of Rob Ford’s opponents: that there is very little inefficiency in Toronto’s government (KPMG says 96% per cent of services in Public Works—the area covered by this phase of the report—are required) and that finding savings for taxpayers will require cutting services. Seriously, that’s what it says. Rob Ford, of course, campaigned by saying repeatedly that he would lower taxes without cutting services. He said repeatedly that simply making the functioning of government more efficient and eliminating waste would realize huge savings. He said, “we don’t have a revenue problem, we have a spending problem.” KPMG, after being paid handsomely by Ford’s city hall, would beg to differ, it seems. The vast majority, 96%, of services that report through the Public Works Committee are core municipal services, either mandatory as a result of provincial legislative requirements or essential to the continued operation of the City as an urban area. The exceptions are described on the following page. The KPMG review of parks and environment services, released Thursday, was the fourth commissioned to identify the city’s “core services” and what can be cut. Four more will be released on staggered days next week. Instead of finding the “gravy” Mayor Rob Ford promised to strain from the city budget, KPMG has so far suggested likely non-starters — taking fluoride out of drinking water — and the painful, like closing city-run daycares. The Toronto Mayoral Debate: Now where do we stand? Getting the reins of power is one thing; holding the reins is another thing. The horse represents a will unto itself and controlling it is not as easy as one would like. In other words, once in office, a newly elected leader discovers that getting everybody to pull in the same direction at the same time doesn't necessarily work due to the competing goals of the various interests. You start with a plan then, if you'll excuse my French, s**t happens. While Rob Ford has certainly tapped into a very visceral sentiment of "Stop the gravy train" - Who doesn't want to get "those bastards" stealing our money? - I have to ask myself whether or not Mr. Ford has ability, the knowhow and the moxy to pull it off? I hand over him the reins of power; can he ride the horse? Or is the horse going to buck and is Ford going to be thrown to the ground like a rodeo participant at the Calgary Stampede? In last night's debate, Ford hammered home his accusation of Smitherman's complicity in the eHealth scandal. The truth is not so cut and dry. According to the Globe and Mail, Mr. Smitherman was the provincial health minister for 4 and a half years but was moved by Premier Dalton McGunity to the Ministry of Energy and Infrastructure in June, 2008, three months before the government launched eHealth. How can Ford blame Smitherman for this when Smitherman wasn't even there? It is this type of analysis which needs to be done to ensure that the candidates are telling us the truth. The mistruths or lies or even slanderous remarks do little in my mind to assure me that the candidate in question is going to be the leader I want in office. If a candidate can't get his or her facts straight, how do I know that anything they are telling me is true? The Toronto Star has put together on their web site something they call the "Smell Test" in which they look at specific campaign statements made by the candidates and examine whether or not these statements are true. The Toronto Star endorsed Smitherman this past Sunday, October 17 so you might say their analysis is slanted but in going through the various points; they do discover some negatives about Smitherman so I'm not finding this one sided. It is balanced and fair. Ford's mantra through this campaign has been "Stop the gravy train". From what I understand, the Ford camp has now produced a T-shirt with this slogan. At face value, this seems like an idea anybody could get behind. In a YouTube video, Ford rattles off a list of perks given to city council members he thinks are unjust to Toronto taxpayers. Seems pretty compelling. In the Star's analysis (Ford's problem with free perks) of Ford's promise to remove these "free perks" and in so doing save Toronto $20 million a year, I see numbers which add up to a different picture. The total given by the Star is less than a half a million dollars, far short of this $20 million quoted by Ford. This is a perfect example of how Ford's statements sound good but do not hold up to mathematical scrutiny. Even if the Star is wrong on this one, I see nothing from Ford's camp which would substantiate his $20 million claim. This just doesn't add up. Ford has promised to scrap the fair wage policy. The Star (Ford's vow to scrap fair wage policy) points out the numbers do not match up with Ford's promises and Ford has failed to show hard numbers to back up his claim. On top of it, getting rid of this policy would involve convincing the province to rescind provincial legislation and apparently a report produced by the city itself has stated that this would entail a long and protracted litigation with little likelihood of success. If this is true, Ford cannot hold his promise. If the Star is wrong, Ford once again has failed to provide a detailed plan on how he would make this work. This just doesn't add up. Movie Review: Crazy, Stupid, Love. Shania Twain: Man! I Feel Like a Woman!